Greetings from the Hilltop, blog readers! 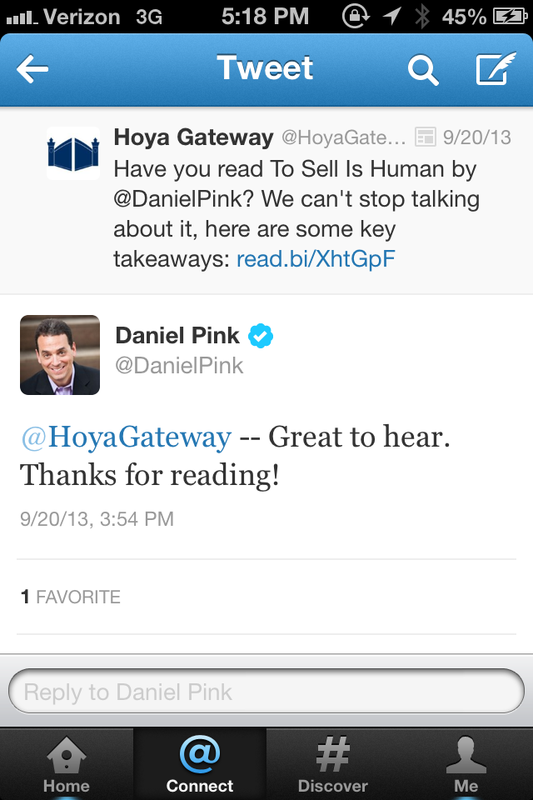 Whitney Pezza, Associate Director, Alumni Career Services, here to guest blog today, and share with you one of my new favorite books, “To Sell Is Human” by Daniel Pink. Who should read it? Anyone who is interested in being a more effective persuader. Anyone who is interested in better understanding the people with whom they work and interact. Why? According to Pink, everyone is in sales now, and in order to be an effective seller, it’s crucial to understand how to best persuade others to take action. The days of the sleazy car salesperson should be long behind us – sales is about much more thank most people think, and everyone is doing it. Pink commissioned a study that shows that people, from lawyers to teachers, spend 40% of their work time selling something. I hope you find the time to enjoy and learn from this book! Be sure the check out the discussion guide, too. The elevator pitch. Your matchbox statement. Your tagline. Your brand. When I think of these I think of something rehearsed and awkward sounding. Like a kid playing grown up. Like creating a headline for an online dating site. Gimicky. Salesy. An elevator speech doesn’t have to be a series of contrived, memorized sentences. If you do some thinking in advance about your personal brand and professional experiences it may not feel so awkward. An elevator pitch is rarely one sided – it’s part of a conversation – so don’t make it feel like a monologue. 1. Keep your audience in mind. Are you talking to an investor? Fellow alum? Potential employer? Friend of a friend? Your company CEO? This will not only change the content but the tone of your elevator pitch… from formal to friendly, from focused to familiar. 2. It will change over time. While you may have your standard elevator pitch in mind, also spice it up with some recent highlights or developments (and some of those developments may be episodic or over time). Did you just surpass a goal? Host a recent event? Attend a conference? Complete an educational endeavor? Travel for professional purposes? Has your company grown significantly in the past 18-24 months? 3. Have a few different versions. This goes back a bit to #1. If you run into your boss or boss’s boss in the elevator your elevator speech is probably going to be more about some recent happenings in your area. In this case you may want to mention some of the headlines in your work as of late. Did you just launch a new program or product? Did your team just pass a significant milestone? 4. What makes you/your work/your company unique? How do you stand out from the competition? What is the compilation of key attributes that make you different from people in a similar role or with a similar background? 5. Be interesting. In other words, if someone says “what’s new?” have an answer. What’s the most exciting part of your work? What is your proudest accomplishment? What project have you been working on most recently? Sometimes your personal and professional brands collide. In a networking environment, preliminary talk often lead to conversations about what connects us – hobbies, interests, activities. Those are just as much a part of your personal brand. Check out this great article from FastCompany about The Problem With Your Elevator Pitch and How to Fix It.